when you have the responsibility of bringing a cake to a meeting each week, you can run out of ideas. after all, no matter how great something is, most people like variety. luckily for me, i have a large file of recipes and a fearless sense of adventure when it comes to baking cakes. so if you take that sense of adventure and add chocolate to it, chances are you get a good cake. when i wrote my second book, i included many cake recipes that were considered classics. cakes such as angel food, hummingbird, blackberry jam, tomato soup and many more. one of my favorites is a chocolate mashed potato cake. potatoes are a wonderful addition to cakes and breads. they add moisture and structure and very little potato flavor. 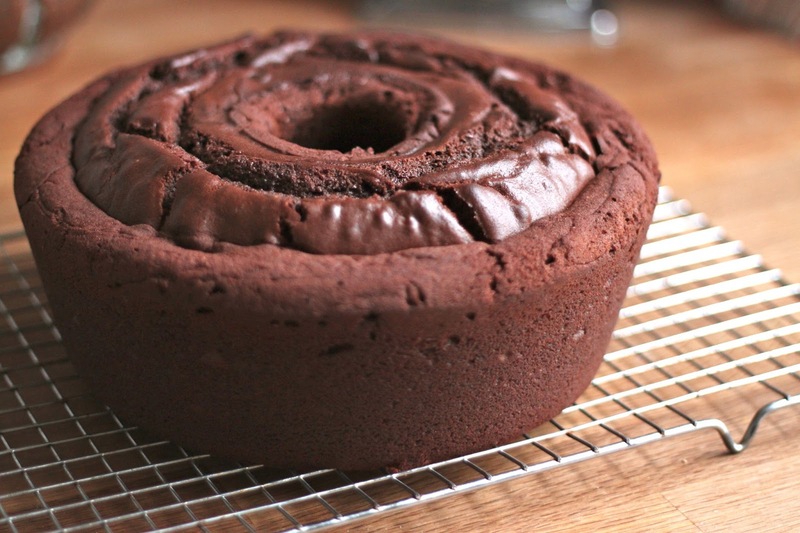 preheat the oven to 350. grease and flour a large bundt or tube pan and set it aside. peel the potato and cut it into large cubes. place in a sauce pot and cover with water. place over medium high heat, bring to a boil and cook until the potatoes are tender. drain the water off and using a masher or a mixer, mash the potatoes until no lumps (or very small ones) remain. measure out 3/4 cup for the recipe. take the remaining potatoes, season them as you desire and eat them before they get cold. in a large mixing bowl or the bowl of a stand mixer, place the sugar, cake flour and baking soda and with the mixer on low, allow the mixture to combine, about 1 minute. add the potatoes, butter, melted chocolate and vanilla and mix on low speed to combine. raise the speed to medium and allow it to beat until fluffy, about 2-3 minutes. while this beats, whisk together the eggs and the buttermilk. slowly add the mixture to the batter. scrape the bowl well and combine it completely. scrape the batter into a pan and bake until a pick inserted comes out clean, about an hour. allow the cake to cool in the pan for 20 minutes and then remove it from the pan to finish cooling on a rack. prepare the glaze recipe and glaze the cake after it is completely cooled. place the ingredients in a small saute pan over low heat. 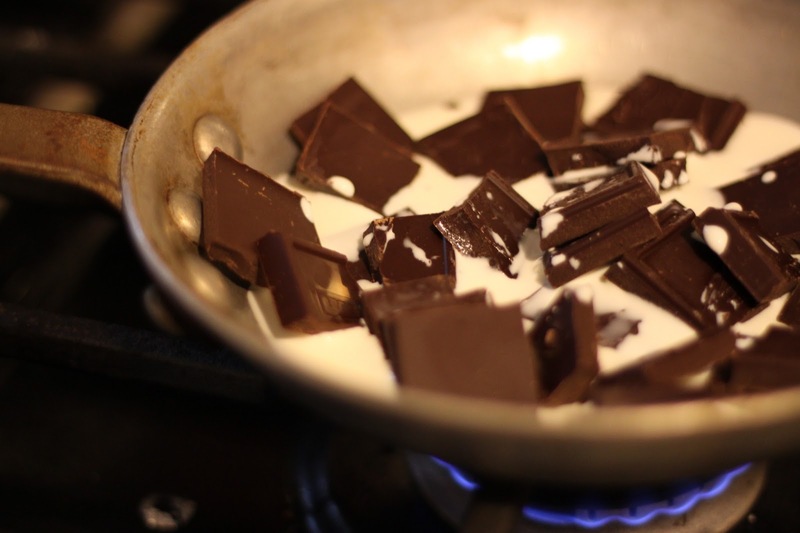 as it heats, stir to melt the chocolate. do not let it boil or simmer. keep stirring until half the chocolate is melted. remove from the heat and stir to melt the remaining lumps. 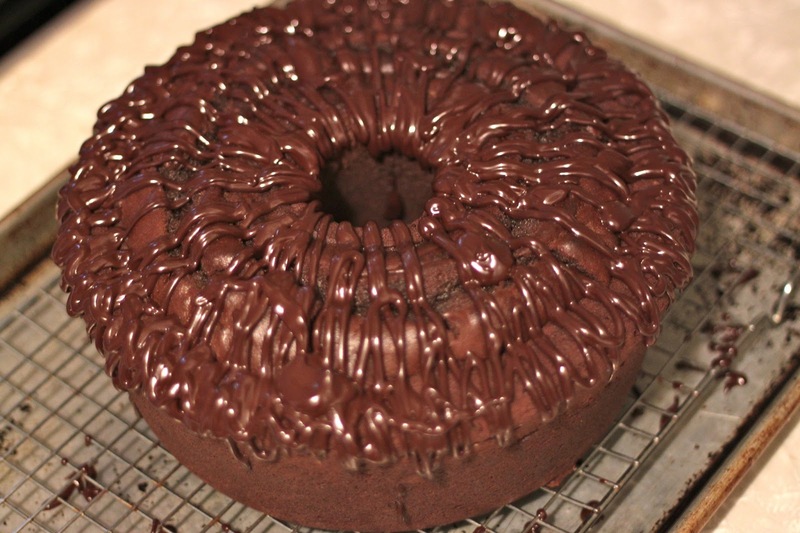 use a piping bag or a spoon to drizzle the glaze over the top of the cake.